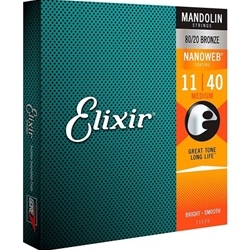 Elixir 11525 Mandolin 80/20 Bronze Nanoweb Strings..
r Nanoweb Mandolin Strings Medium .011 - .040 More and more guitarists are choosing Elixir coated guitar strings. The PolyWeb coating feels comfortably smooth and reduces finger squeak while delivering a balanced tone and smooth response. Elixir strings retain their bright tone 3 to 5 times longer than normal strings. The coating protects the winding from the elements that can make your strings go dead so you don't have replace your strings as often as uncoated strings.